How does a pitcher who doesn’t strike out batters at an average rate for relievers (6.72 K/9, reliever average well above 7 K/9) become the best reliever in his pen? Lopez did it by not walking anyone (five all year, or 0.67 BB/9) and keeping the ball on the ground (55.7%). Those aren’t always the traits of a great closer – managers love the strikeout – and so Lopez may not be fantasy-relevant in most leagues. But if your league counts holds, or you are looking for a reliever to keep your ratios down, remember this name. If you’re looking for strikeouts, Norris could be your man; if he could pick up some of that control from Lopez through osmosis, he’d be a veritable ace. He struck out more than a man per inning (9.25 K/9), and that’s valuable. But he struggled to locate his secondary stuff, and his walks spiked as a result (4.51 BB/9). Given that he’s also a flyball pitcher (41.4% groundballs for his career), he’ll really need to cut down on the walks to fulfill his promise in the starting rotation. Rodriguez struggled out of the gate (4.97 ERA, 1.52 WHIP before the All-Star game), but a fine second half brought him back to upper-echelon levels (3.60 ERA, 1.29 WHIP). Though his strikeout (8.22 K/9) and walk (3.14 BB/9) rates were the worst he’s shown in three years, they were still strong. He’s a little older than you might think (32 next season), but in the short-term he’s still a good keeper on a staff mostly devoid of young keeper pitching. J.A. Happ, for instance, strikes out more than a full batter fewer than Rodriguez, and usually walks at least a half-batter or more than him too. Paulino is a little like Bud Norris in that he can strike a batter out (8.15 K/9 last year), struggles with control (4.52 BB/9 last year), and put up a stinker of an ERA in 2010 (5.11). But Paulino may have an easier time harnessing his stuff. In his first 100 major league innings, he walked fewer than 3.5 batters per nine innings, and even after a poor second 100 innings, he’s got a manageable 3.89 BB/9 for his career. As a flyballer, he’ll always be a little vulnerable to the gopherball. But look for that unsightly ERA to improve next year if his control settled toward career norms. For more on Felipe Paulino, Bud Norris, Wandy Rodriguez and other young Houston Astros, check out Bloomberg Sports’ Fantasy Tools. Previously, I described why a player’s overall value during the final few weeks of the season becomes less important than contributions made in specific categories. I recommended some batters available on free agency in many fantasy leagues who could provide targeted value as fantasy competitors seek standings upside. Jhoulys Chacin is currently striking out 9.66 batters per nine innings. Bud Norris is currently striking out 9.27 batters per nine innings. 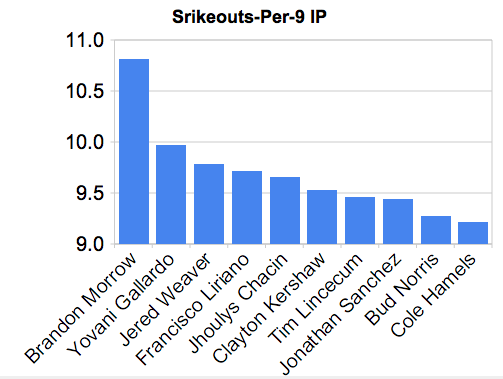 Among all pitchers in baseball this season with at least 90 innings pitched, Chacin and Norris rank 5th and 9th, respectively, in strikeout rate. Both pitchers are unowned in nearly 75% of fantasy leagues. That may be because both pitchers are quite young, and thus unreliable, and neither sports an ERA under 4.00. But the two have other commonalities: Good prospect pedigree, an xFIP (a measure of ERA based on peripheral stats) under 4, a not-too-intensive workload this season, and most importantly, the ability to throw balls past a bat. Koji Uehara seems to be the closer du jour in Baltimore after notching an impressive four saves last week. Unlike some past Orioles given that opportunity, Uehara may actually have the ability to hold the job. Uehara came over from Japan last season after a very respectable career there. Most notably, in 2007, Uehara was a shutdown reliever for the Yomiuri Giants with 32 saves and a 1.74 ERA. Last season, the Orioles wanted to try him out in the rotation, and he posted decent numbers before being lost to injury for the season. This year, he moved to the pen, but again lost much of the season thanks to a DL stint. Still, look at the numbers when he’s been active: a 1.91 ERA and 31 strikeouts to only 5 walks in 28.1 innings. He’s owned in less than 10 percent of fantasy leagues, probably because people don’t think that a closer for last-place Baltimore will get many save chances. 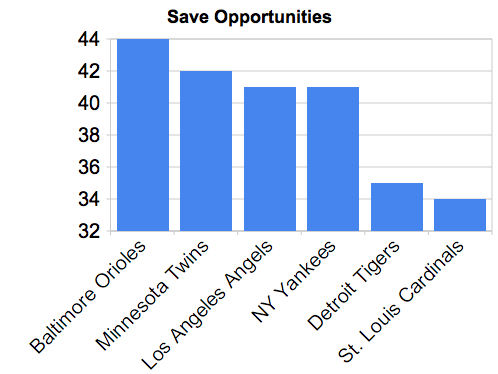 However, the Orioles actually tie for 14th among the 30 teams in the number of save opportunities generated for the team’s relievers. The Orioles won’t win many games, but when they do, the score is usually close. Jake Westbrook has been fantastic since coming over to the National League in a trade deadline deal. In five starts for the St. Louis Cardinals, he’s struck out 31 batters and allowed only five walks in 31 innings, which adds up to a 2.58 xFIP. Unfortunately, he only has one win to show for his efforts. That might change soon, however. The St. Louis Cardinals have an extremely favorable schedule the rest of the season, with series against the Astros, Pirates (x2), Padres, and Cubs. The team is locked in tight races for either the NL Central crown or a wild card berth. Westbrook not only gets a favorable upcoming schedule, but also great run support from Albert Pujols and company. The team ranks sixth in the National League in runs scored. Sometimes deep league managers have a hard time reading fantasy advice columns. “But he’s already owned” is the refrain of many a frustrated dude (or dudette). Jeff Zimmerman at FanGraphs did a little piece about ownership cutoff rates in fantasy leagues and what the definition of a ‘waiver wire guy’ is depending on the size of your league. The upshot is that players who are owned in 11% of Yahoo fantasy leagues or fewer are on the waiver wire if your league rosters 350 players. That number drops to 6% if your league rosters 400. So, in other words, if you are in a 14-team league with 25-man rosters, your waiver wire should be full of guys that have about an 11% ownership level. With that in mind, let’s look at two very different pitchers who are owned in 9% of Yahoo leagues. They are both interesting pitchers, but it will be up to your personal preference whether you take Bud Norris or Chris Volstad in the end. Apples and oranges here, but we’ll cover Norris today and Volstad in a subsequent post. Norris’ overall 78.2% contact rate this year puts him between Adam Wainwright and Ubaldo Jimenez in that category — elite company. He was top-five in contact rate outside the zone last year, so it’s no fluke. He has a 9.5% swinging strike percentage in 2010 – which is above average (around 8.5% across baseball). So Norris brings legitimate stuff to the table. Some of his other peripheral stats are nearly off the charts. His 12.08 strikeouts per nine innings would be very impressive if he wasn’t allowing a correspondingly terrible 6.39 walks per nine innings. It’s a rare combo. Take a look at this chart from the Bloomberg Sports Fantasy Tools — those other three dots with huge strikeout rates are Tim Lincecum, Dan Haren and Jonathon Broxton. To approach that group’s overall performance, Norris will have to maintain his elite strikeout rate while also improving his command significantly. Is there a chance he develops his abilities further this year? Let’s take a look at the locations of his pitches this year (click image for full size version). You may notice something about the red squares. Yeah, he’s all over the place with his fastball. Looks like rearing back for that gas really hurts his command of the pitch – only about 55% of those fastballs find the zone. Norris’ other pitches find the zone more than 60% of the time. A look at the spin and movement graph of Norris’ pitches shows that he only really has two pitches this year. He’s a fastball/slider guy, and that’s why whispers of future reliever duty have followed him up the ranks. Satchel Price at Beyond the Box Score recently had a post that outlined the reasons to move a pitcher to the bullpen (Insider link), and inconsistent command of a smaller repertoire was one such condition. But if we look at last year’s spin and movement chart to get a larger sample size, the change-up actually looks like a legitimate pitch (see how distinct the purple squares are on the left). Since he can command it better than his fastball and it has shown a distinctly different movement and spin in the past, the change-up might be Norris’ path to fewer walks in the future. This year, the change is getting the best whiff rate of his three pitches (19.4%); it has the potential to be a strong third pitch for Norris. If you are interested in strikeouts no matter what the damage to your WHIP, Norris is already a play for your mixed league team. If you’re looking for further development from Norris, watch his fastball command and change-up usage. If they trend up in future games, we may yet see solid, more consistent starting pitching from Norris. He can certainly miss bats. 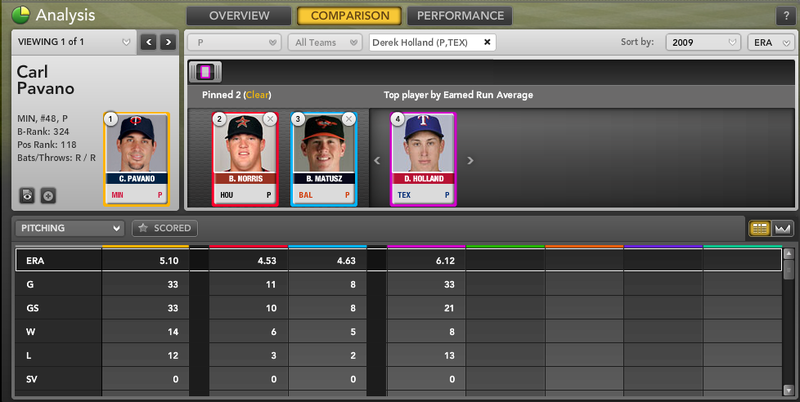 For more on Bud Norris and other flame-throwing starters, check out Bloomberg Sports’ Fantasy Tools. Carl Pavano has long been a whipping boy, an entry into a word association game when the term “fragile” came up, and a baseball punchline. Pavano thrived in relative anonymity last season, posting a good enough year with the terrible Cleveland Indians to earn him a trade to the contending Minnesota Twins. Rather than testing the frost-bitten market, Pavano accepted the Twins’ offer of arbitration. And boy, who can blame him? The Twins added some fun toys for his usage in the form of a new middle infield with high defensive reputations and offensive ability. Nothing about Pavano screams fantasy asset. He’s a pitchability type, someone who relies on getting groundballs and avoiding mistakes. His injury-heavy past makes him more of a risk than most and he’s always given up quite a few homers. Pour all of that information into a bowl and whisk softly for a few minutes until the aroma of sleeper hits you. Right? Well, evidently not, since Pavano is being drafted at an average spot of 188th. His B-Rank is a low 324th and his positional rank (meaning of all pitchers, not just starters) is 118th. 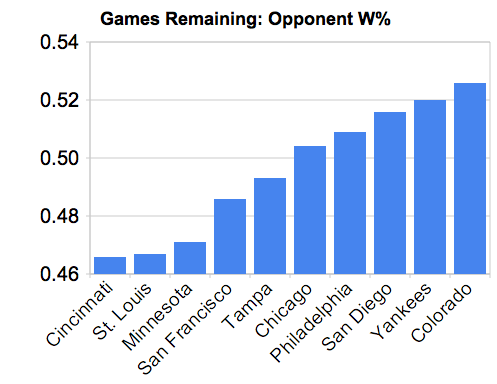 Pavano is pitching for the AL Central favorites, so wins should be available. The defense behind him is strong, so his ERA could be playable. He doesn’t strike many out, but then again he doesn’t walk many either, so his K/BB and WHIP are passable. But, is he really worth a top-200 pick? The immediate options that surround Pavano in the B-Rank standings are young talents like Bud Norris, Brian Matusz, and Derek Holland – three pitchers with considerably more upside who aren’t being drafted until the 250-270 range, if it all (in Norris’ case, he’s not being drafted). 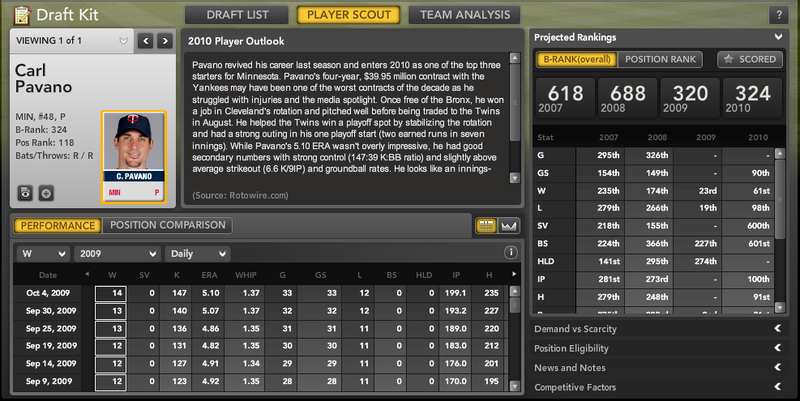 It’s not that Pavano is worthless or unworthy of being considered a fantasy option. It’s just that he’s being favored in front of options with a lot more potential to help your team. In shallower leagues, there’s no reason at all to take Pavano ahead of these younger pitchers: You can always find another generic SP with a 4.50 ERA and 12 wins on the waiver wire in a 10- or 12-team mixed league. But Holland and Matusz have the potential to be top-tier pitchers if or when their breakout comes. At the end of your draft, take the upside pick, not predictable mediocrity. For more information on possible over- and underrated starting pitchers and more, check out Bloomberg Sports’ fantasy kits.